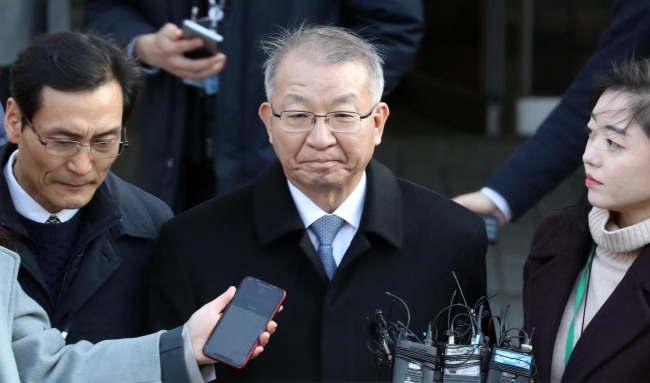 The prosecution indicted Yang Sung-tae, former Supreme Court chief justice, Monday on charges he abused his power to influence politically significant trials and disadvantage justices critical of him. Ending an eight-month investigation, the Seoul Central District Prosecutors’ Office filed 47 charges against Yang, including abuse of power and dereliction of duty for approving or orchestrating the use of trials in backdoor deals with the previous Park Geun-hye administration. In a dramatic fall from grace, the veteran judge with a career spanning more than four decades, who is now in custody, became the first former or incumbent Supreme Court chief justice to be arrested and indicted in the judiciary’s 71-year history. The prosecution also brought charges against Park Byong-dae and Ko Young-han without detention -- both retired Supreme Court Justices and former heads of the National Court Administration -- for their roles in implementing Yang’s order. Park and Ko were indicted on 33 and 18 charges, respectively. In return, Yang sought to secure support from the Park administration to dispatch more justices at South Korea’s embassies abroad and to establish a separate court of appeals, according to the prosecution. Some 100 former and incumbent judges are suspected of being involved in the power abuse allegations. The prosecution plans to decide who to file charges against. Former deputy NCA head Lim Jong-hun was indicted earlier for his involvement in the case. The prosecution on Monday added a new charge against him, accusing him of abusing his power to disadvantage judges critical of Yang in personnel transfers. Prosecutors also named in the indictment some former and incumbent lawmakers from the ruling Democratic Party of Korea and main opposition Liberty Korea Party as soliciting favors in trials involving them. Prosecutors plan to decide whether to take legal action against the lawmakers after they see whether the judges suspected of conspiring with the lawmakers are indicted.